It might have been a small undetected comet, perhaps similar to the fractured Comet Shoemaker-Levy 9, which was widely seen to strike Jupiter in 1994. 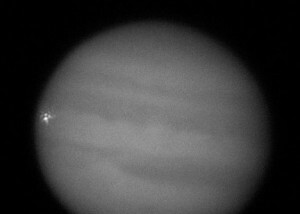 Amateur astronomers are reporting a bright spot on the planet Jupiter, apparently an explosion in the planet’s upper atmosphere caused by an incoming piece of space debris that struck yesterday morning – September 10, 2012 at 6:35 a.m. CDT (11:35 UTC). Jupiter is the largest world in our solar system and a gas giant world. What we see of the planet – its red-and-white banded surface – is only the tops of the clouds in its exceedingly dense upper atmosphere. Comets and asteroids have been seen to strike Jupiter’s clouds in the past. Yesterday’s apparent explosion occurred in the cloud tops of Jupiter’s North Equatorial Belt by American amateur astronomer Dan Petersen of Racine, Wisconsin. He was using a 12-inch telescope to observe the planet. He wrote on the Cloudy Nights forum that a “bright white two-second long explosion” happened just inside Jupiter’s eastern limb, or edge. What Would a Starship Actually Look Like? Quark: Smallest Thing in Universe? Extreme Life Forms on Eccentric Exoplanets? Voyager 1 Really Leaving Solar System? Human Mars Mission by Dutch Firm in 2023?